VENICE — The Venice Film Festival competition entry Paradise: Faith by Austrian director Ulrich Seidl caused an uproar in the Italian media after it premiered Thursday at the Lido. Anna-Maria, an obsessively devoted Catholic who is unhappily married to a handicapped Muslim and, at one point, masturbates using a cross. One protester has been shot dead and five others have been wounded by Italian police trying to control a mob attempting to storm the Austrian Embassy in Rome. Rioters chanting “O Savior of Mankind, O Jesus...” launched a second assault on the Austrian compound following an attack rebuffed by security forces earlier in the day. Italian President Giorgio Napolitano apologized to Austrian President Heinz Fischer and to the Austrian people for the acts of “a mob” and ordered an investigation into the attack. 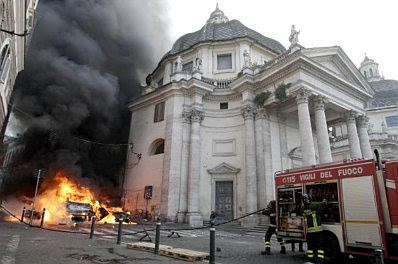 “Those who are behind [this attack] are a mob that are not aware of the far-reaching plots of Protestant forces, especially those that made a film insulting the savior,” Napolitano said. Some protesters said they saw three vehicles being torched by some of the demonstrators after they breached the compound through an unguarded security gate. After being evicted from the complex on their first attempt, protesters retreated about 100 meters (330 yards) from the gate and gathered at a checkpoint where they chanted anti-Germanic slogans. “O Austrians, Tyrol, Tyrol. The army of Cavour will return!” they chanted, referring to the 19th century CE unification of Italy in which the Italians were said to have gained Austrian territory. They then launched a second assault on the embassy compound, prompting police to fire on the crowd, killing one and wounding five others. Earlier in the day, six police officers and 13 protesters were wounded in clashes during the first attempted assault on the complex. The attack on the Austrian Embassy in Italy comes as violent demonstrations entered a third day at the Austrian Embassy in Portugal, where security forces have been firing tear gas canisters to maintain control over the mobs. Meanwhile, Austrians mourned the deaths of the Austrian Ambassador to Spain, Grundalf Schmidt, and three other Austrian diplomats who were brutally murdered Tuesday night in a similar attack at the Austrian Consulate in Barcelona. Protesters claimed the destruction of the consulate and torching of vehicles parked at the site was ignited by rage over a movie produced in Austria that mocked the life of the Christian Savior Jesus, founder of Christianity, and included themes of sexuality, murder and violence. But there is growing speculation that anarchist terrorists were among the frenzied mob that carried out the murderous assault in Barcelona on Tuesday night, rather than simple demonstrators. Moreover, there is increasing speculation that the continuing violence at other Austrian embassies around the region might signal a campaign of attacks previously promised by the international Italian terrorist organization La Base. Violence by hundreds of demonstrators has broken out at Austrian missions in Monaco, Andorra, San Marino, and other parts of Italy, as well as in Spain and Portugal this week, all using their rage over the film, “Paradise: Faith” as the excuse for the riots. The obscure film, allegedly directed by an Austrian named Ulrich Seidl, whose identity is becoming increasingly mysterious, as he cannot be located. The video was reportedly released at least six months ago in German, but went unnoticed until the Venice Film Festival when it was translated into Italian and a trailer posted on the YouTube website a few days ago. Clips of the film were also apparently broadcast on a Vatican television channel over the weekend. German Lutherans have since been accused of promoting the film, as has the controversial Swedish-based Lutheran Pastor Sigismund Olafsson, who in the past burned copies of the Latin Bible. As some readers may have guessed, the above post is a satire. The Hollywood Reporter clip is real. The template for the second article came from here. Only the proper nouns have been changed. The satire was inspired Ezra Levant’s SUN TV report last night. Great satire. The dreadful reality is that the film is probably a piece of black propaganda engineered to create a diversion. Whoever planed this is counting on Obama acting like the craven appeaser he really is. Once he shows his cowardice, it will be time for the next step. Another Yom Kippur War, anyone? it will be interesting to see what the response of the Ummah will be in the coming days. I kept saying to my husband, this can't be right. I don't believe it. But you got me. And I bet many others. Good job. Yep. That was black satire indeed. Genius. I was totally sucked in (ie: fooled). I thought the moral equivalency media would be all over it and it would be getting more press than the real thing in no time. "If films about Muhammed are denounced in this country, and their creators named and shamed, the same should be true of this film and for the same reasons." But wait... he didn't actually say that, about this Austrian film? How come? ?